The Stunning Bali high efficiency gas suite is a complete fireplace & gas fire combination. 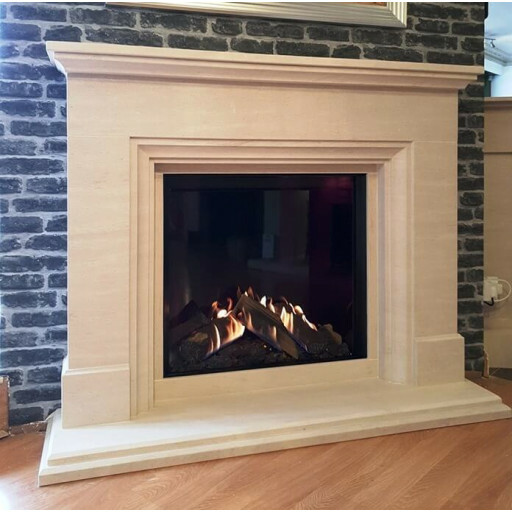 The fireplace is honed from solid natural Portuguese limestone, itself a stunning piece. However, combine this with teh fabulous Gazco Reflex 75T gas fire, as we have done & this fireplace suite is in another Galaxy. The fire features a class leading 8.6kw of heat in to the room and features Gazcos unique & industry leading electric LED ember effect under the burner, that give a cosy, warming glow that you can have when the gas fire is off or on. The innovative burner technology in the Reflex 75T gas fire makes it Gazco’s most realistic fire to date. With the addition of hand painted ceramic logs and the non-reflective glass front, this gas fire echoes the aesthetic of a real open-fire. The Reflex 75T comes with the Harmony10 remote control to adjust the height and heat of the flames as well as to set a daily or weekly schedule to suit the homeowners lifestyle. The fire can also be set to maintain a specific room temperature along with controlling the EmberLight LED bed that can be enjoyed with and without the flames.